I must admit I did not think my first review for 2014 would be a non-fiction book. Since I tend to read more fiction than non-fiction and all my reviews reflect that truth. Anyway, there is always a book that jumps out at you and asks to be read and reviewed. Why Jesus by Ravi Zacharias is such a book. Also, I have one more admission to make before I get into the review. Ravi Zacharias is my favorite Christian apologist. I’ve hesitated in reviewing this book because I didn’t want to have my objectivity compromised by someone you truly respect and admire. However, I believe in reading this book has been this best thing for me because you still have to judge the book on its own merits and not about your personal feelings towards the author. Zacharias tackles one of the biggest themes currently in Western Spirituality. The subtitle of the book (Rediscovering His Truth In An Age of Mass Marketed Spirituality) covers a wide ground and Zacharias does an admirable job in presenting his argument for Christianity. He explains how the New Age Movement got spiritual lineage from Eastern pantheistic religions like Buddhism, Hinduism, and Taoism. The attractiveness of those religions have been craftily repackaged for Westerners who are seeking spirituality away from Christianity. Zacharias argues that all religions are not the same and have exclusive tenets for their believers. However, one of the effective marketing methods of the New Age Movement is that you can have spirituality without the religious and theological dogma of monotheistic religions like Christianity, Judaism, and Islam. I heard him speak about this book recently and he wanted to title the book From Oprah to Chopra. But, the publisher decided against it and went with the aforementioned title. Zacharias devotes a couple chapters to Oprah Winfrey and Deepak Chopra and I feel that non-Christian believers would read those chapters and see him attacking them for their embracing of New Age Spirituality. However, I thought in reading those chapters were worth the entire price of the book. Zacharias shows quite a bit of sympathy towards Oprah while bringing up strong arguments against some of the beliefs she had incorporated on her TV show. While he does go after Chopra quite strong for some his views, Zacharias argues point-by-point against those beliefs in a fair manner. What reading Why Jesus reveals that most people have a spiritual hunger inside and are determined to seek it. Now that we have a religious supermarket where people can choose some of this religion and a little bit of that religion unfortunately misses the mark. Zacharias reveals that all religions have a worldview and to create a gumbo spirituality will truly not make you spiritual or religious. In closing, I would like to write as a Christian reading and reviewing a book like this one does affirm and strength my faith. That’s easy. However, I believe that non-believers should give a book like this one a try. Because it isn’t always about affirmation but information. Even though you may not believe in Christanity. Whatever your beliefs are have an origin and worldview they subscribe to. At least one should have some kind of knowledge on where your beliefs come from. Also, I would like to write that I studied Taoism and practice Astrology before I became a Christian. I have always been a searcher for spiritual truth and it has led down some interesting paths. And reading a book like Why Jesus shows that knowledge and truth about different faiths is needed in order to satisfy the spiritual hunger that man has always had. 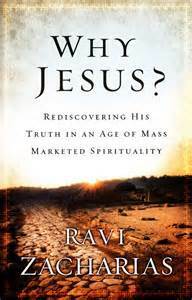 I give Why Jesus by Ravi Zacharias a highly recommended rating and a good start to my reading and reviewing year in 2014.